The GDPR (General Data Protection Regulation) is an important piece of legislation that is designed to strengthen and unify data protection laws for all individuals within the European Union. The regulation has become effective and enforceable on the 25th May 2018. Please note: we're not lawyers, so please consult with an attorney when in doubt. What is LandingCube doing about GDPR? We have been working to guarantee LandingCube's own compliance, and assessing how it will affect our own customers. We are fully committed to achieving GDPR compliance. Probably not. If you aren't incorporated in the EU, do not sell on Amazon Europe, and if you don't target customers inside of the EU, GDPR does not apply to you. This describes the majority of our customers. Which product changes has LandingCube made? To facilitate GDPR compliance, we've added the following features. Lets users add a consent checkbox to their optin forms, such as "I'd like to receive email updates on future promotions". 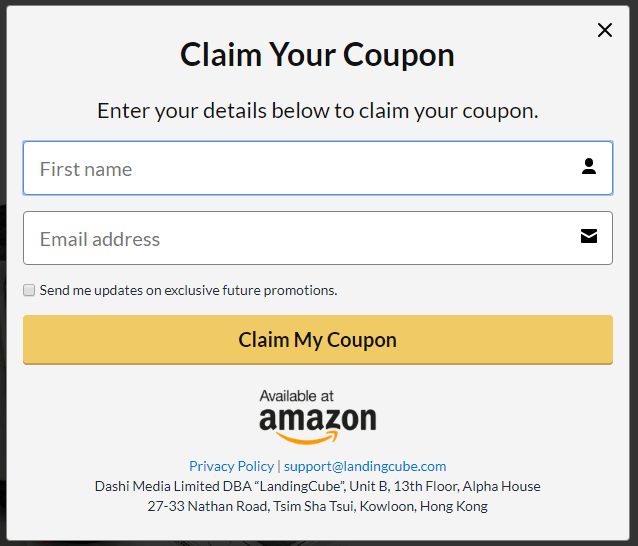 If your users doesn't check the checkbox, they'll still receive their coupon code. However, they won't be forwarded to your email provider. You can turn on the EU GDPR Checkbox in your settings. If you've decided to turn on LandingCube's GDPR checkbox, LandingCube now stores the consent status (eg. consent given? true/false), and the text of the consent checkbox (eg. "I'd like to receive email updates on future promotions"). To view your customer's consent status, please navigate to the Customers screen and click export. What do LandingCube customers need to do? The biggest change for LandingCube users is that going forward, if you want to send marketing emails to EU users after they receive a discount, you'll have to get their consent. You may want to enable LandingCube's GDPR checkbox feature, and/or enable double optin. This makes sure you have your customers' consent to market to them. Sign our data processing agreement. Under GDPR, your EU users have the right to request a copy of all personal data you have on them. They also have "the right to be forgotten", meaning you deleting all data you have on them. To get all the data LandingCube has on a user, simply navigate to the Customers screen, and export your data. Then, search the spreadsheet for your customer's email and/or name. If one of your users requests their data to be permanently deleted, please contact LandingCube support and we'll be able to assist you.